Get hypnotized by this mashup of Dinosaurs and The Notorious B.I.G. Remember Dinosaurs? For those that don’t, it was a ’90s sitcom that ran for four seasons before ending on one of the biggest downers of all time. The creature effects were handled by the Jim Henson company, with lots of puppeteers in large costumes and expressive, animatronic faces portraying the Sinclair family. It spawned the catch phrase “I’m the baby, gotta love me” which, in turn, spawned this ungodly music video. But who knew that the true musical genius lay not with the Baby but instead with the father, Earl Sinclair, and his ability to lay down smooth rhymes? 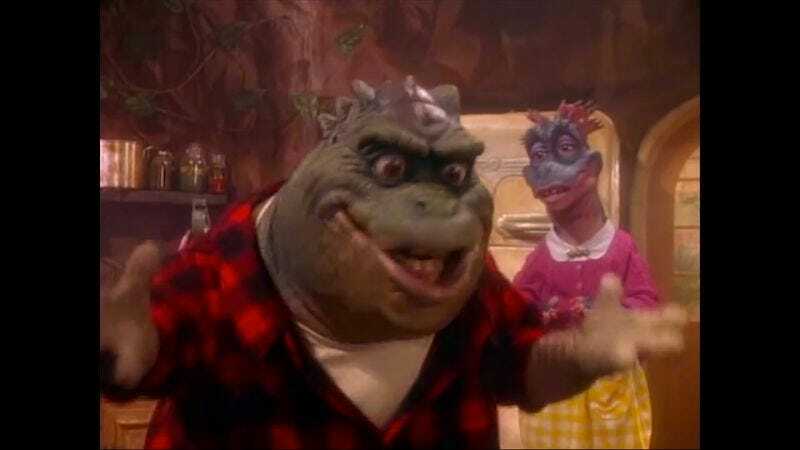 Redditor animalrobot (a.k.a Benjamin Roberts) spent three days taking footage from Dinosaurs and using Earl Sinclair as the mouthpiece for Notorious B.I.G.’s megahit “Hypnotize.” With the nonspecific mouth movements of the puppet, coupled with the character’s tendency to dance and sashay about, Roberts is able to deliver a pretty impressive mash up of the two that no one asked for but everyone now needs to see. Roberts’ work suggests what really killed the dinosaurs: too much swagger. Eh? Eh? Ah, just the watch the video.